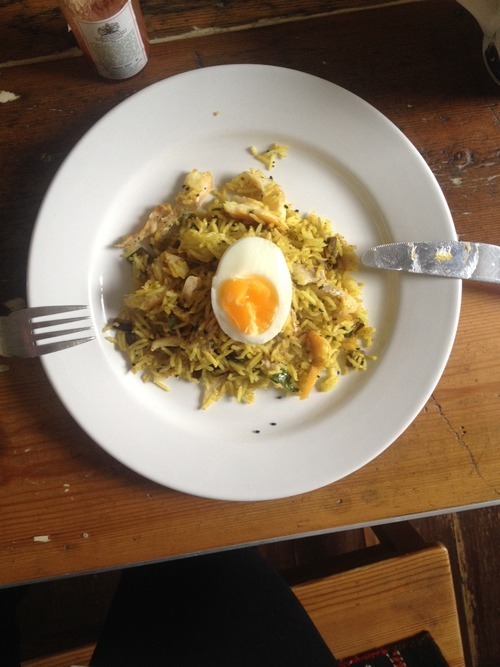 A week ago I was staying with the wonderful Ayca and Rob, and after dinner, Rob had the bright idea to make kedgeree for breakfast the following morning. There was a significant amount of rice leftover, and he whipped a packet containing 2 smoked haddock fillets from the freezer to defrost overnight. Oddly, kedgeree wasn’t a dish I grew up with, and indeed the person who really introduced it to me, whose version has become something of an archetype, is Chris. His rendering of the classic is fresh and zingy with lots of lemon, parsley, and chopped fresh red chillies as a garnish. It is delicious, and to enrich it, he uses some of the water from poaching the haddock to cook the rice, ensuring a good distribution of fishy flavour. 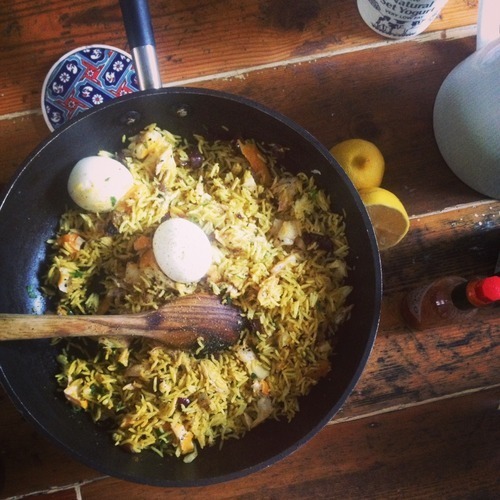 Other than the inclusion of egg, fish, curry powder and rice there aren’t many rules to kedgeree – indeed in the Financial Times last week, I had an unusual moment of disagreement with Rowley Leigh over the inclusion of sultanas and salmon in a version he wrote up. Like my mother, I tend to object to the addition of (what I regard as) a luxury fish like salmon to a simple dish. The usual victim of this in my eyes is fish pie. The kedgeree I prepared on this occasion was fairly spartan in its extras, as we were using things up, but was successful I think, and sorted me out until around 3pm, meaning I had no need to interrupt my day in the library to snack. The nigella (black onion) seeds give it a toasty warmth. Bake or boil the haddock (we baked it) – until tender and cooked. Remove skin when cooked. Put the eggs on to boil. Melt the butter in a pan on a low-ish heat, and add the onions to soften. Add the curry powder and nigella seeds and stir in. Add the rice and coat well with the spices. Add more butter if the mix is too dry. Make sure the rice is well warmed through. Stir in the flakes of haddock and the parsley, season with salt and pepper to taste. Place a halved, almost hard boiled egg on top of each portion. Tabasco, and lemon to squeeze on if desired.